Some Tuesday morning thoughts as I finish taking in the Husky victory last weekend before fully turning my eyes towards Pullman and the ESPN GameDay hosting hysteria of this weekend. Per Rivals.com, the Ducks currently sit third nationally for the 2019 recruiting cycle. After witnessing the “best college game I’ve ever been to,” No. 1 overall prospect Kayvon Thibodeaux announced that he would be moving up his commitment date. While no guarantee, that’s a very good sign for the Ducks. Match that with the fact that the Oregon offense starts zero seniors, and the future looks bright. Halfway through this 2018 season, the Ducks are the least-penalized team in the Pac-12. Last year, the Ducks were the most-penalized team by a quite a margin. Oregon has not finished higher than 10th in penalties since 2010. Mario Cristobal has this team disciplined. 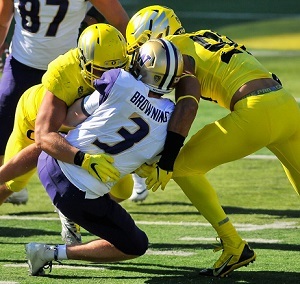 The Ducks victory over the Huskies means the Pac-12 has a very slim chance to make the College Football Playoff. For Oregon to make it, they would not only need to win out, but also have a lot of other teams lose once, if not twice. The weak non-conference slate (thanks Texas A&M) is seriously working against the Ducks after the Stanford loss. Even in the spread, up-tempo era, controlling the line of scrimmage and playing good defense ultimately wins championships. And that’s what the Ducks did against the Huskies. They didn’t need to rely on an all-world effort from quarterback Justin Herbert. There have been Natty’s won with pedestrian quarterback play. Hell, Alabama pulled their ineffective starting quarterback late from the title game last year and still won it. Go figure. 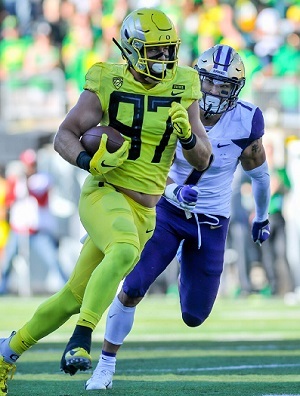 Now if the Ducks can continue to get better in the trenches, continue to play better defense, and continue to produce top-notch quarterbacks, things will be adding up quite nicely in Oregon’s quest for a championship. 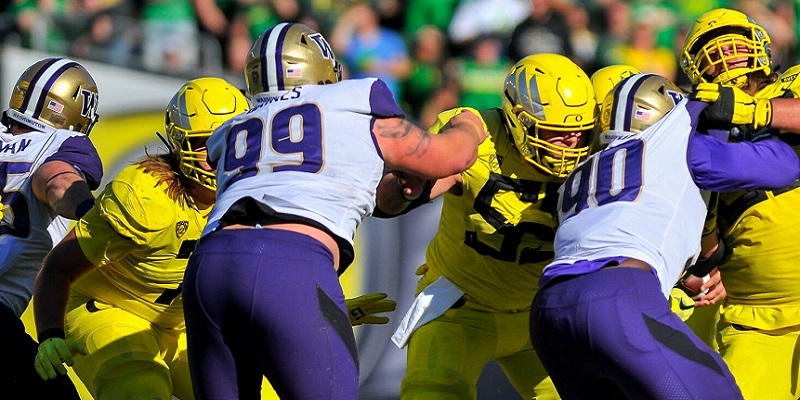 Oregon and Washington exchanged the lead four times last Saturday. And just for good measure, the teams had to play more than 60 minutes to decide winner. Tight End Ryan Bay on a nice gain. All this Dillon Mitchell talk got me thinking about single-season records. The single-season record for receptions at Oregon is 77 (Samie Parker, 2003), while the single-season receiving yardage record is 1140 (Josh Huff, 2013). At the half-way point of the season, Mitchell has 35 receptions for 561 yards. While slightly behind pace, both records are within reach, particularly given how Mitchell has played since conference play started. Some think it’s cool, other find it nauseating, but the Cougar faithful have had their flag at every ESPN GameDay for 15 years straight. Now, they finally get GameDay. With all eyes on Pullman there is no way they can handle the spotlight … they will “Coug-it.” Big-time. 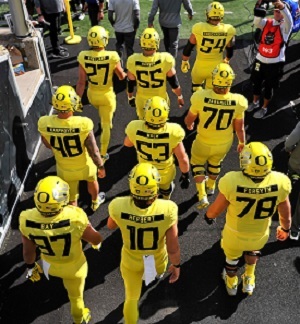 The Ducks enter Autzen to play those Huskies. Before the time-out that occurred prior to the winning six-yard run, someone in the Oregon coaches box noticed the Huskies were dropping eight defenders in coverage. They were betting on the Ducks passing. That’s when Cristobal called time-out, and the Ducks made the call to run. With Willie Taggart, that doesn’t happen (Charles Fischer touched on this in his article published after the game). His in-game adjustments and play calling was pedestrian at best. When Slick Willie left, we were mad as a fan base. We were left with no choice but to buy into the “things happen for a reason” mantra. But, as we’ve been discovering the past several months, it was a good thing Taggart pulled a Slick Willie and bolted to Florida State. It gave us Mario Cristobal. So, this got me thinking deeper about another thing that “happened for a reason.” That being the 2015 broken hand of Vernon Adams. Without that messed up hand, Adams most likely hits a wide open receiver against Michigan State to win that game. And no doubt the Ducks would have beaten Washington State that year, had Adams played. Had that happened, an immensely flawed Oregon team goes 11-1 and plays in Rose Bowl and possibly the College Football Playoff, where it no doubt gets destroyed by Alabama or Clemson. Now had that happened, then no way would Mark Helfrich have been fired after just one bad season in 2016. Therefore, we don’t get Slick Willie, hence we don’t get Super Mario, hence we don’t get the Super Mario who doesn’t take a knee versus Stanford, which may well cost the Ducks a shot at this year’s CFP. Which is maybe what keeps a certain sure-fire first round NFL caliber quarterback to stick around to lead an even better Oregon team in 2019, and finish what he started. Remember … things happen for a reason.